As part of the 4th DANTE project consortium meeting, participants were invited to join a public social event, organized by the Bulgarian-Romanian Chamber of Commerce and Industry. 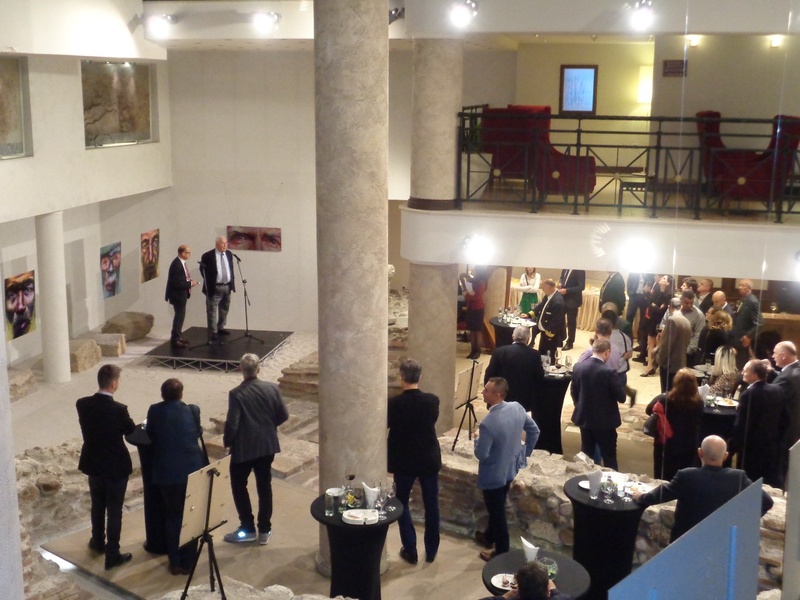 The event, entitled “A view of the river: Danube as an Ecological Alternative for Efficient European Transport”, took place in Hotel Arena di Serdica, among the remains of the roman Amphitheatre of Ancient Serdica. Among the participants of the consortium meeting, the list of guests included representatives of the diplomatic corps, the legislative, executive and local authorities from Bulgaria and of the chambers of commerce. After officially opening the event, Mrs. Eleonora Ivanova, head of BRCCI, invited Mrs. Ulrike Straka, Commercial Attaché to the Austrian Embassy in Bulgaria, to share her views on the topic. Mrs. Straka shared her belief that the Danube is a deeply rooted symbol of the Austrian national identity and that other countries should also accept the river as a symbol of connectivity and cultural heritage. Mr. Șerban Cucu, Secretary General of the Romanian Association of ship owners and port operators, stated that “Bad infrastructure, maintenance of the waterway, facilities and administrative barriers are some of the main challenges on the Danube”. He also reminded the audience about the challenges vessel operators are facing due to unpredictable fairway conditions and to poorly executed dredging works. With better planning and investments for the year-round maintenance of the waterway, however, he believes that these challenges can be easily overcome. According to Mr. Cucu, in order to achieve a year-round passage on the river, investments comparable to those needed for the building of 2 kilometers of highway are needed. Besides challenges, the Danube also represents a huge potential for the economic development of Bulgaria thanks to the cruise tourism on the river. According to Alexander Kamenov, a captain with 20 years of river experience, only 10% of the passenger ships sail to routes on the Lower Danube. A very small portion of the affluent passengers from Western Europe, USA and third markets make return visits to the Bulgarian-Romanian section of the river. In order to increase the attractiveness of this section of the Danube to tourists, investments in supporting infrastructure - like ship stands, panoramic roads along the river and land tourist routes – are needed.